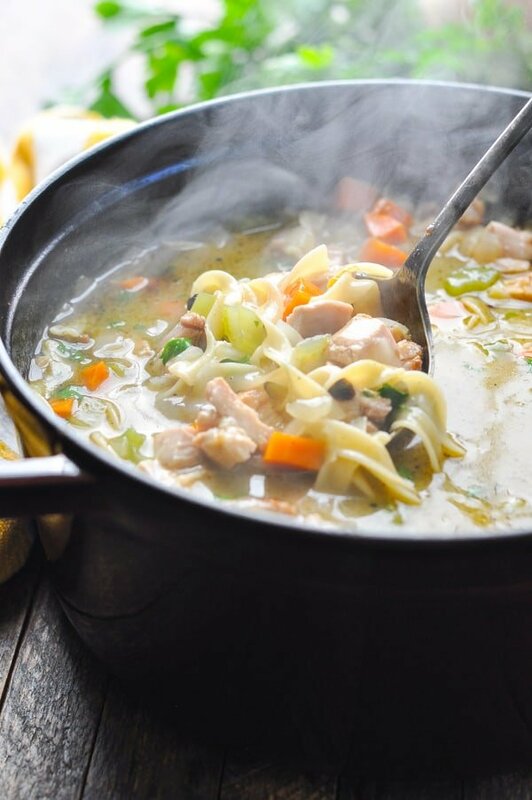 This Homemade Turkey Noodle Soup recipe is made without a carcass for an easy, healthy dinner that's ready in about 30 minutes! Do you have some leftover turkey from your holiday celebrations? Or maybe just a rotisserie chicken that you picked up at the grocery store? 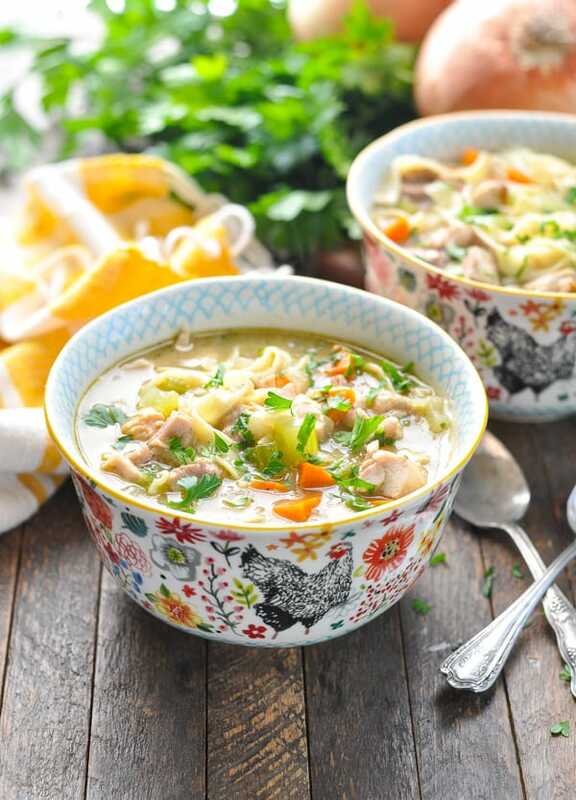 This Homemade Turkey Noodle Soup recipe is made without a carcass for an easy, healthy dinner that’s ready in about 30 minutes! 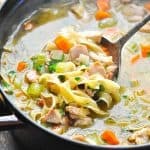 This slightly creamy turkey noodle soup is the best of both worlds! You get the comfort and nourishment of a homemade soup, without the tedious effort of making broth from a carcass, straining, or long simmering times. 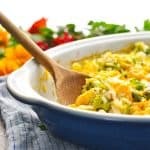 Instead, the easy recipe takes advantage of leftover turkey or chicken for a one pot meal that cooks quickly on the stovetop! 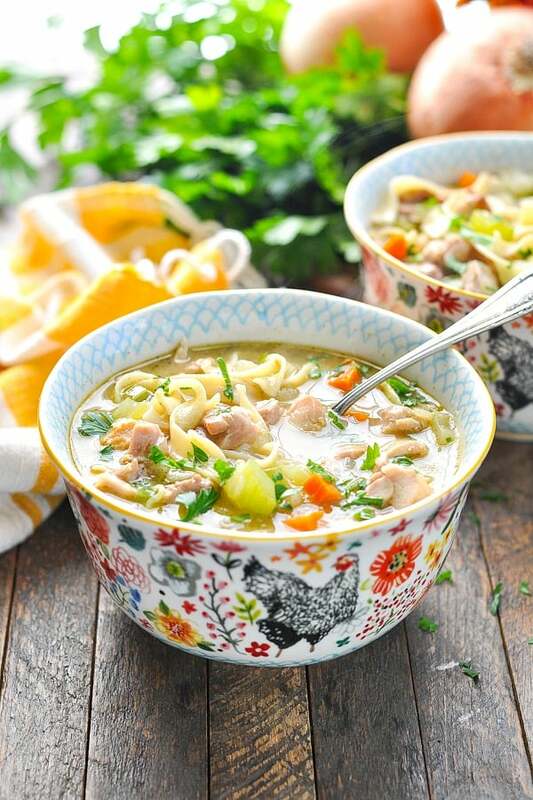 This is the perfect turkey noodle soup for busy weeknights! 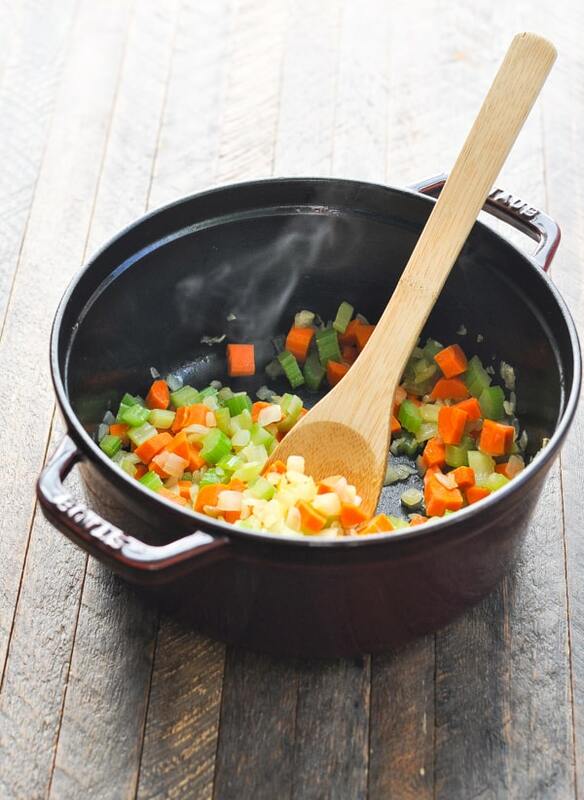 First, sauté diced carrots, celery and onion in olive oil in a big soup pot or saucepan. Your house will smell so cozy and delicious already! 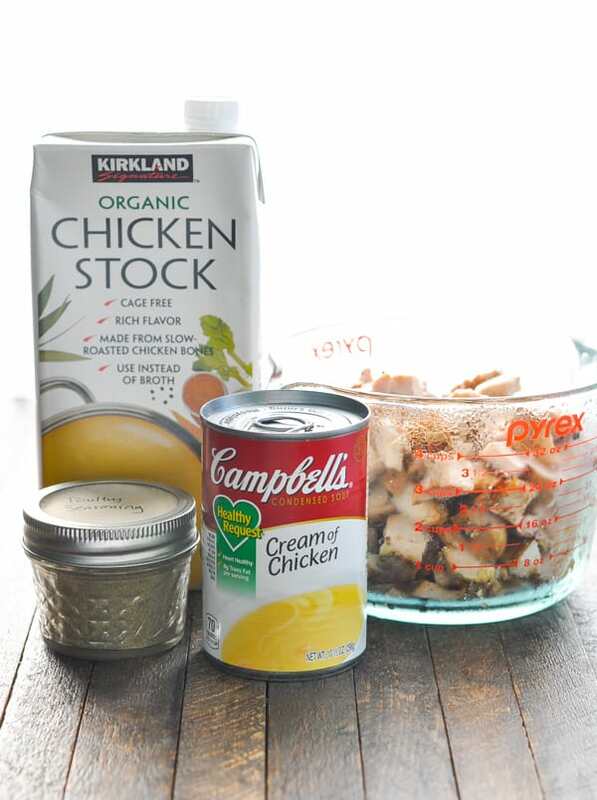 Next, add the broth (or stock), condensed cream of chicken soup, diced turkey (or chicken), and poultry seasoning. Bring the soup to a boil. Once the soup is boiling, stir in the uncooked egg noodles. Reduce the heat to low and gently simmer for 7-9 minutes (or until the noodles are tender). I like to garnish the soup with a bright burst of chopped, fresh parsley. 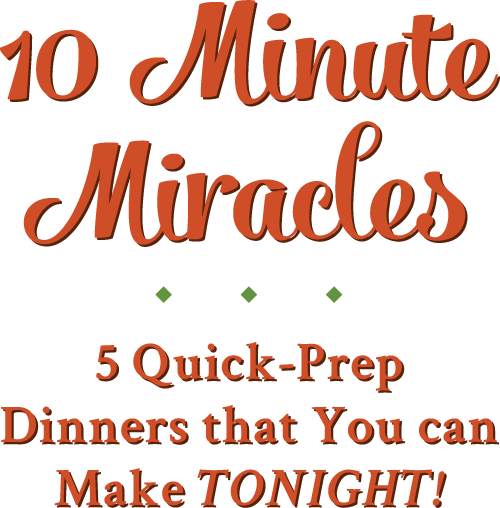 Canned soup just can’t compare to this nourishing 30-minute meal! 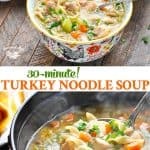 Can you freeze Turkey Noodle Soup? Definitely! The soup freezes very nicely. 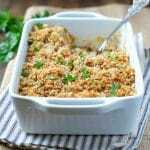 Allow to cool to room temperature, divide into individual servings in airtight containers, and freeze for up to 3 months. I like to use these deli containers to easily freeze and stack my soups and sauces. You can also just put the soup in a large Ziploc bag and freeze it flat to save space. 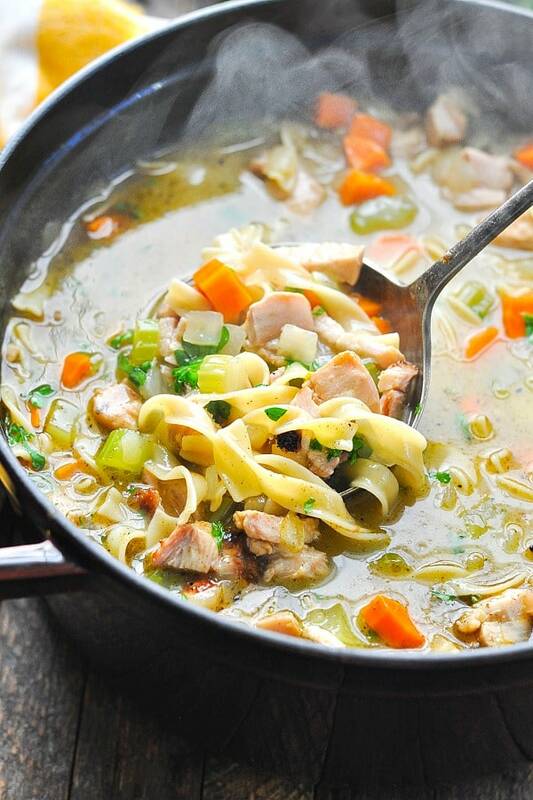 Make chicken noodle soup by swapping out the turkey with an equal amount of cooked, diced chicken. You can even buy the rotisserie chicken from the grocery store and throw some of that in the pot. I say take as many short-cuts as possible! 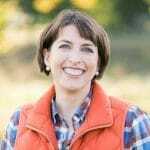 Have a turkey carcass that you want to use? 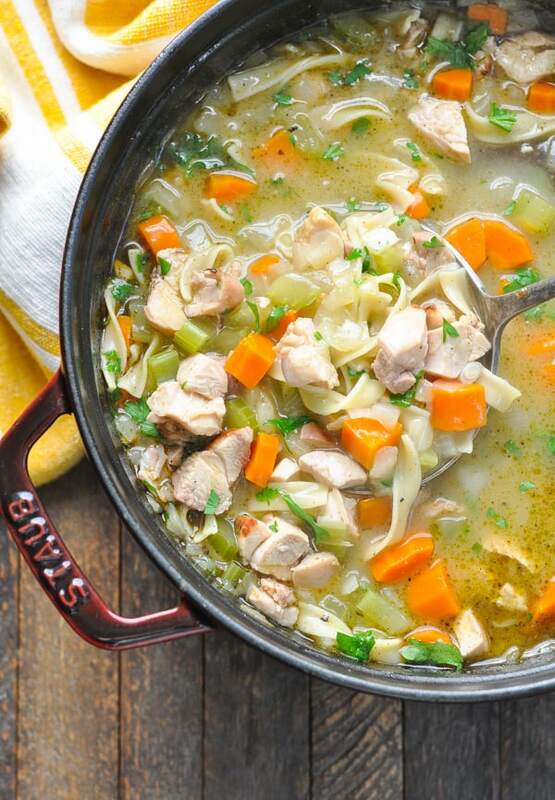 You can make your own turkey stock to use in this soup. 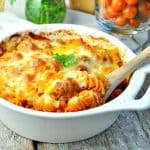 Substitute other pasta for the egg noodles! You can use a small pasta like ditalini or a short pasta like bowties, too! Stir in extra water or broth, as desired, so that the soup reaches the desired consistency. 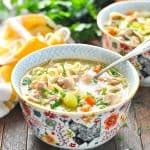 It’s a pretty thick soup (which we love)! Heat olive oil in a large saucepan over medium-high heat. Add carrots, onion, and celery and cook, stirring occasionally, until tender (about 10 minutes). Add broth, soup, turkey, and poultry seasoning. Increase heat to high and bring to a boil. Stir in the noodles, reduce heat to low, and simmer at a low boil for about 7-9 minutes (or just until noodles are tender). Season with salt and pepper, to taste. Stir in fresh parsley just before serving, if desired. Substitute other pasta for the egg noodles! You can use a small pasta like ditalini or a short pasta like bowties, too! 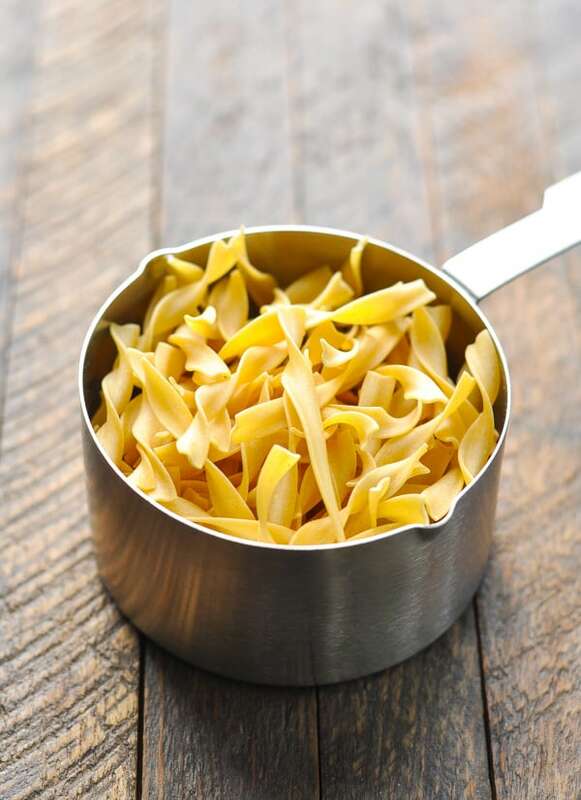 Just be aware -- if you use a different shape pasta, the cooking time may vary slightly. Stir in extra water or broth, as desired, so that the soup reaches the desired consistency. It's a pretty thick soup (which we love)! 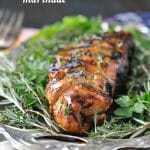 This recipe was originally published in December, 2013. It was updated in November, 2018. I thought about adding turnips and potatoes, what do you think? Just add more broth? Sounds great, Lisa! Yes — I would just add a bit more broth, to taste. Enjoy!